Another contribution from our readers Ingrid and Gösta. 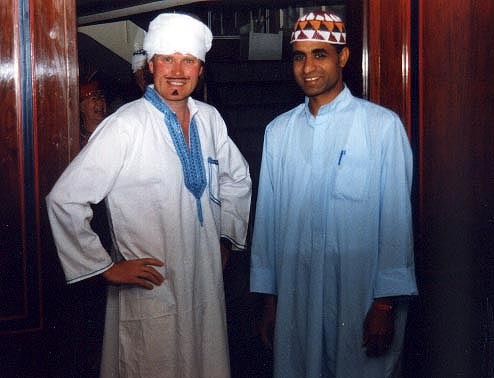 Here is a travel tip from a cruise on the Nile. We sailed on Isis, a special cruise river boat built for the shalow river. 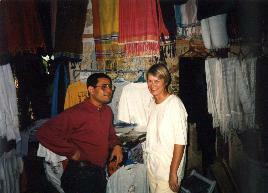 We started off in Luxor and had a seven night cruise a head of us. This little ship only took 90 passangers and there was a pool. 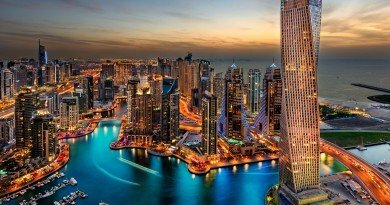 lounges, bars and a restaurant. Staff onboard was about 30 young men. The first two days was spent in Luxor, we saw the two impressive temples of Karnak and Luxor and on the second day we crossed the river to the West Bank. The sun sets in west and therefore all the pharaohnic tombs are here. The picture is from the female Pharaoe Hatshepsuts’ temple. 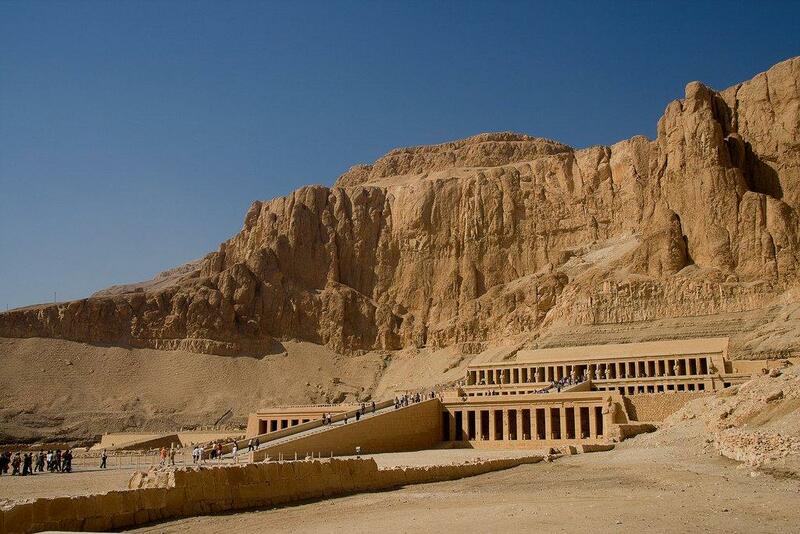 Behind this temple is the famous Valley of the kings. 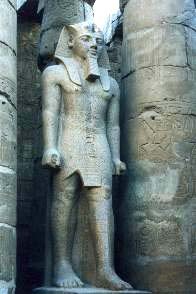 One of many gigant statues of a pharaoe in Egypt. This statue is portrayeded as an alive God as the legs are parted. Many statues have the legs closed, pharaoh being dead. This picture is from Karnak Temple. 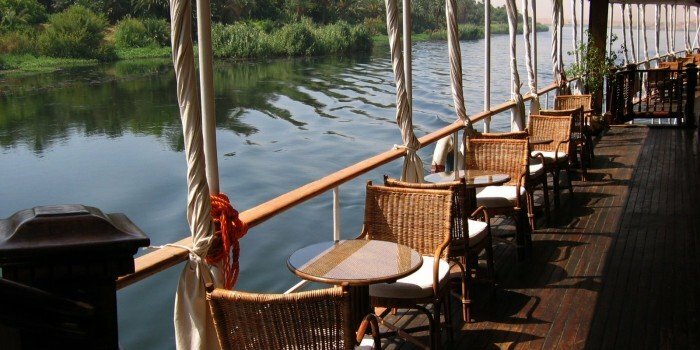 It is a beautiful and tranquil travel cruising on the Nile. The smell of the sand and the dryness from the desert is special. Once in a while you would se a buffaloe, herons drinking water, women washing clothes and children playing. Everything taking place along the Nile. 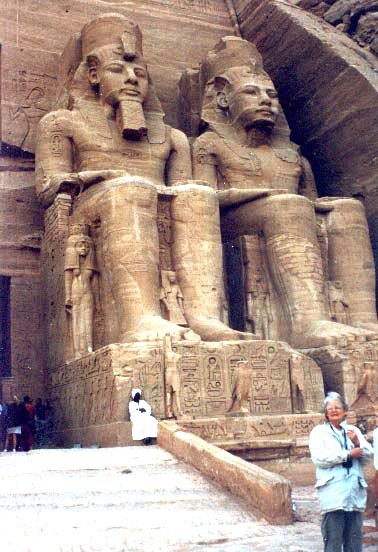 One morning we had a wake-up call att 04AM to take a three hours buss ride in the desert to the Abu Simbel Temples. 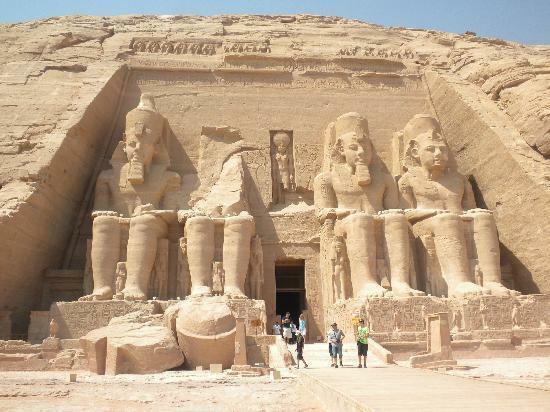 This monstrous construction was one of Ramses II’s biggest achievements. The statues are about 100 feet tall. After building the Aswan Dam, the nile flooded and almost destroyed all buildings in the southern part of the country. 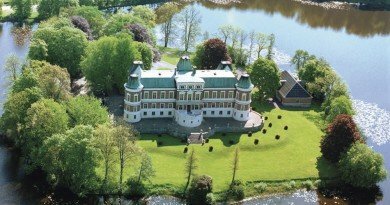 Swedish engineers managed to saw the tempel apart and rebuild it in a safe place. Wonderful views over the river in Aswan. 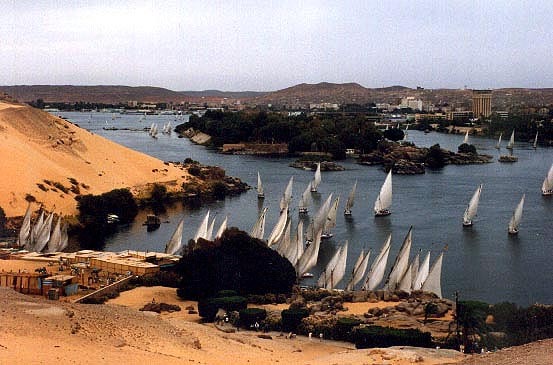 All Felucca sailing on the river. 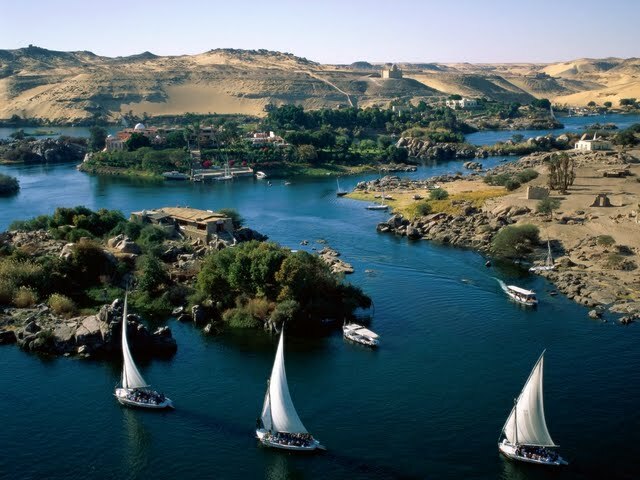 Aswan is the final stop for all cruise ships as the first cataract hinders the ships to continue on the river.. The final night a board was a Pharaohnic Night and costumes were rented. On this pic is one staff and a norwegian guests. It has been one of the most amazing tours we ever done, so many impressions and everyday was filled with excitements. 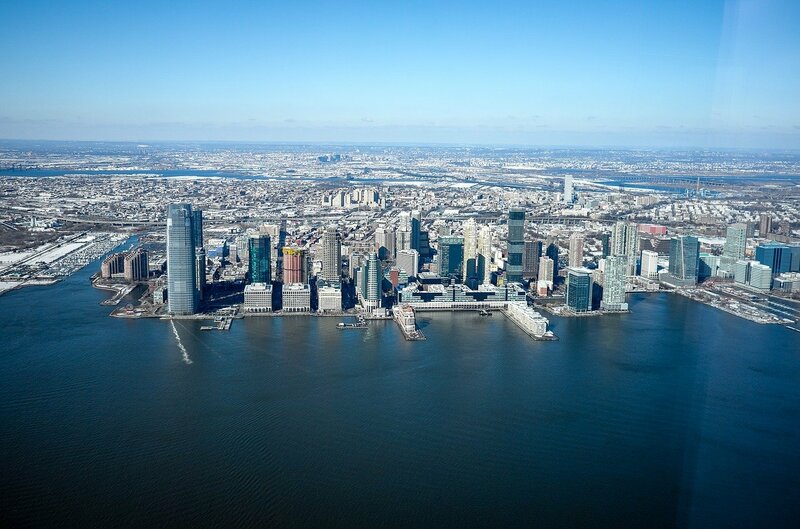 It is a trip we can recommend everyone to do.